To provide a renewable energy lighting solution to the pupils in the Haeju Orphans (Junior) School so that they can study in the evenings and safely go from classroom, to dormitory and to latrine. The DPRK has the least energy access of any country in Asia (App. 1). Power supply is severely restricted in the winter season, especially for any schools and office buildings. It has 523 pupils (335 schoolboys and 188 schoolgirls) and 64 staff members. In 2017 Rotarians successfully completed a project to install 24 solar water heaters on the roof of the school and learned that at night there is little or no reliable energy available. Children of the School can not study at their classrooms after 05:00 pm because it is getting dark. Normally children would have their exercises and sports until 06:00 pm. Staff and teachers communicate each other by mobile phones in terms of teaching and exercising, administration of checking children at night. Due to lack of power supply, they have no means to charge their mobiles. We reviewed several renewable energy solutions and found that solar powered lanterns from Luminaid, a ShelterBox partner, are an efficient and affordable solution. See here a full catalogue of Luminaid emergency lighting solutions. Packlite Halo produces 50 Lumens and can operate up to 10 hours on one solar charge. The school has 93 dormitory rooms and 48 classrooms. There are 498 desks each shared by two students. We will supply 500 units of Luminaid Halo for each desk and 5 units of Luminaid Max 2-in-1 to enable 5 staff administration members to charge mobile phones for better safety. KOMT - Committee for the Promotion of International Trade of the DPRK - which has facilitated 10+ previous Rotary projects in DPRK. Responsible for in country project management, logistics and monitoring. Luminaid Lab (luminaid.com) - creator of the solar powered Luminaid packlite. They have granted us a substantial humanitarian use discount. Rotarians - project development, funding, implementation and followup. 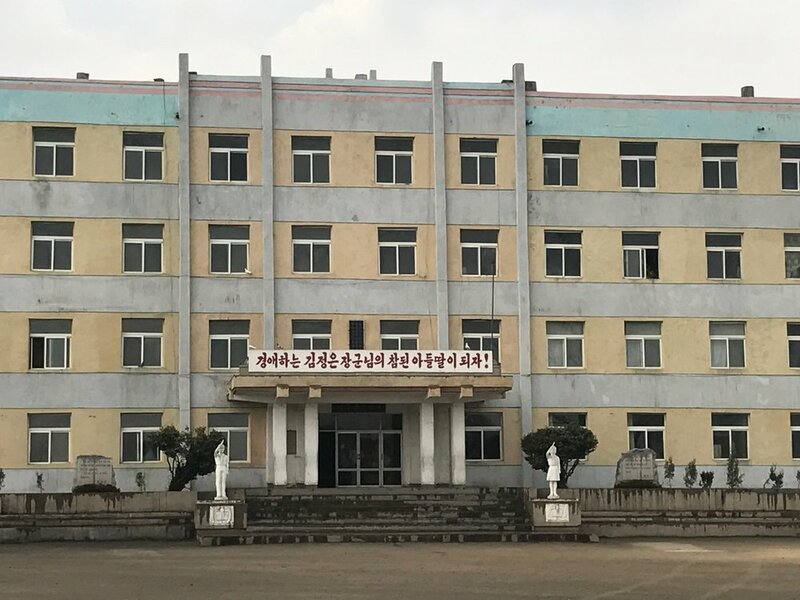 Haeju Orphans (Junior) School students and staff: 523 pupils (335 schoolboys and 188 schoolgirls) and 5 staff administration members. 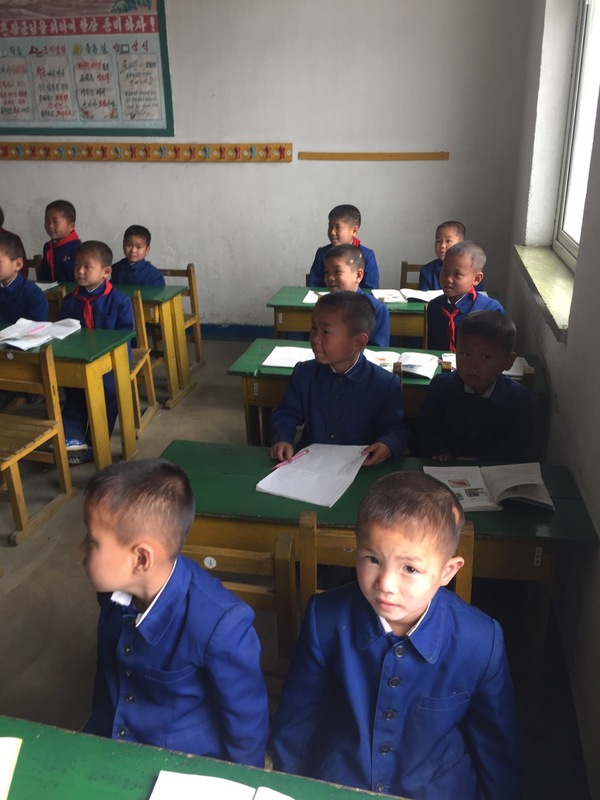 After installation, children will be able to study during the dark winter months and safely walk between their classrooms, dormitory rooms and latrine. This will improve their studies and reduce nighttime injuries. Staff members will be able to keep their mobile phones recharged for communication and safety. Rotarian donors will contribute 90% of the project budget (including 10% allowance for contingency): USD $5,054. (CNY 36765). Korean partners will contribute $543 in kind support - 10% of overall budget. This project commenced in November 2017. Solar lanterns were shipped in the Spring of 2018 and we are now awaiting the final project report from our partners. This project was successfully completed in April 2018. You may download here the final report for this project including project photos from KOMT. 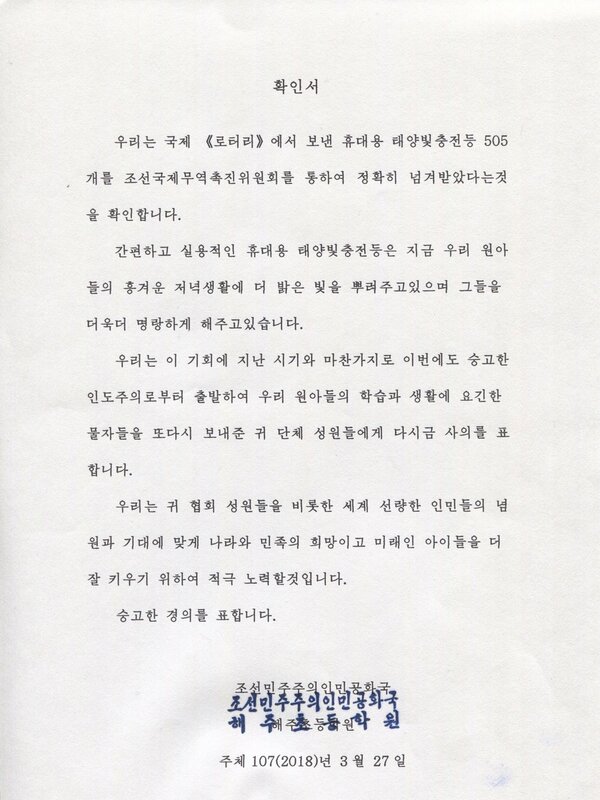 Below are the official acknowledgements from our Korean partners for this project.